Whew! It was an exciting trip to the windy city last weekend. I never expected such a wildly enthusiastic reception to Paleo Desserts. The ALA (American Library Association) National Convention was attended by over 15,000 librarians from all over the country, at McCormick Place in Chicago. Hundreds of library managers “checked out” Paleo Desserts and picked up a free book at my demo in the South Pavillion. 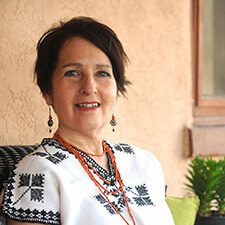 I spoke about Paleo Desserts and demonstrated the Mexican Wedding Cookies. There was a long line for copies of my book, and the cookies were a hit. My book-signing hand is tired today, and the voice needs a rest. I was excited to meet Kevin Hanover, the Marketing director for my publisher Da Capo Press, who organized the event flawlessly. Hey, after that kind of reception I’m tired, and plan to take a break for a boat cruise down the Chicago River. Here are a few photos and the transcript of my talk. I talked about what’s the Paleo diet and made cookies without grain, dairy, or sugar. It was an animated discussion at the ALA What’s Cooking stage. Signing books for hungry librarians is a tough job! I’d like to ask you all a question. Just raise your hands. How many of you love to eat sweets? And how many of you believe that sweets are bad for you? Here’s the tough one: How many of you are willing to forget about that and enjoy them even though that pleasant taste might short-lived? There’s no right or wrong answer. My point is that we DO love sweets, and we think they’re bad for us. Some of us even feel guilty about eating them. We have this funny conflicted idea around desserts. So I decided, since we know we’re going to eat sweets anyway, we’d better make them nourishing and healthy too! How many people do you know that would like to enjoy Pumpkin Pie for Thanksgiving without breaking their diet? How about Chocolate Cake that’s made with blueberries apple and coconut and tastes just like the real thing? Or Red Velvet Cupcakes made with beets instead of red dye No. 5? And maybe we could have a Chocolate Lava Cake that doesn’t send your blood sugar through the roof? How about an easy-roll Pie Crust that tastes better than Betty Crocker? And wouldn’t it be wonderful to serve Yellow Birthday Cake that kids love, and is nutritious too, and won’t make them sugar-crazed and running around? I’d like to tell you how I came to write this book. Then I’d like to share a few statistics of some of our health problems in this country, which motivated me to want to help. I’ll explain in detail what is the Paleo Diet. Then I’ll share with you how Paleo Desserts is changing people’s lives. Then I will demo how to make Mexican Wedding cookies, and we’ll get to taste them. After than we’ll have time for questions, and I’ll sign books. About 8 years ago I became very ill and almost died. I was diagnosed with total adrenal failure, chronic fatigue, 2 frozen shoulders, cancer, and total digestive failure all in one year. As I lay in bed resting, because that’s all I could do. Everything extraneous disappeared. My worries, my friends, other people’s demands on me, my demands on myself all dissolved. It just got quieter and quieter in my world, so I felt sort of suspended in my bed, like I was just a single spark. It was beautiful. And in that quiet something in me shifted. Something so simple and so important that I had to share it. You may laugh… I began to actually listen to my body. To listen and care about it. And to FEEL it’s needs. And my body told me everything I needed to know to get better. It was like following a thread. Slowly as I had the energy, I began to get up and prepare food. I created simple meals that not only were delicious to my taste buds, but that my body liked too. In fact these two things became one and the same. Your digestion is unique. There’s no one diet that’s good for every person, and there’s nobody that knows better than yourself what’s best for you. So I stopped believing 100% in television, advertising, even my mother’s advice was called into question. The clearest response that I got from my body was that it rejected sugar, refined carbs, dairy, and modern processed foods. 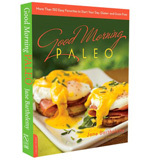 Anyway, the recipes came out so yummy, and there were so many of them, it has turned into a cookbook and a blog, and now a second cookbook is coming out soon on Paleo Breakfasts. As my health improved, it was clear evidence to me that listening to our bodies and the food that we put into them play a major role in our physical well-being. And I was motivated to share my discoveries. Now I’m in excellent health, and have no worries about myself. But I’ve always been a bit of a worrier. So now do you know what I worry about? Well, I worry about us, about our health. And I worry about our children. In the past 40 years obesity in the US has soared. Especially vulnerable are children. Childhood obesity has increased more than 400% in 6 to 11 year-olds. 23 million children or nearly 20% are obese. One third of our children are at early risk of Type 2 diabetes, hyper-tension, heart disease. Michelle Obama has made childhood obesity awareness a major campaign, and everybody is aware of it. But what are we doing about it? 85% of the grains consumed in the US are fiber-depleted, low in nutrients & refined, linked to obesity, diabetes, poor nutrition & digestive problems. A common pattern for millions of people on a western diet of sugar & carbs is to be overweight, hungry, and lacking in real nutrition. It’s time to reverse the trend, by offering delicious, low-sugar, whole food, nutritious sweets. Gluten-intolerance and celiac disease, or the inability to digest wheat, affects 200 million people in the US, or about 2/3 of the population. Diabetes: From 1980 through 2011, the number of Americans with diagnosed diabetes has more than tripled (from 5.6 million to 20.9 million). Alzheimer’s Disease is now called Type 3 Diabetes, and it’s linked to sugar consumption. Diabetics are 2x as likely to get Alzheimer’s. Over 5.4 million Americans have Alzheimer’s now and this is expected to double within a few decades, crippling the medical system. If these modern diseases are caused by sugar, fructose and refined grains, then the Paleo Diet is a possible solution. I mean, if we’re going to eat chocolate cupcakes, why not make caveman cupcakes that taste delicious and are actually good for you? The Paleo Diet mimics the foods our ancestors ate prior to agriculture: Fresh vegetables, fruits, nuts, lean meats & seafood that are high in nutrients. A KEY concept to grasp is that you should always be seeking out NUTRIENT DENSE FOODS, which nourish & lead to normal weight. Interest in the Paleo diet in this country is growing exponentially, as it moves into the mainstream with top selling books. 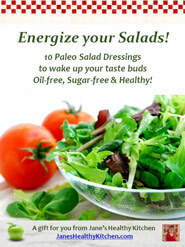 The Paleo Diet is Gluten free and much more. It eliminates gluten AND also the top cross-reactors to gluten: Sugars, Coffee, Cow Dairy, Milk chocolate, Potatoes, tomatoes, peppers, Oats, Corn, Rice, Tapioca, Genetically modified and Refined foods, chemicals, and preservatives. 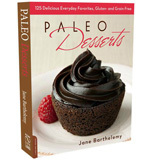 Paleo Desserts is a Breakthrough book. It looks normal, but is NOT. It’s the first and only book in the multi-verse that offers delicious AND healthy sweets low in sugars for millions of people on alternative diets. This makes it an ideal transition for anyone on a special diet who feels deprived. It’s not just for Paleo folks. It’s also for 200 million gluten intolerant, 25 million diabetics, 3 million with celiac, 7.5 million vegans, anyone who chooses to be dairy free, or sugar free. And let’s not forget those 23 M children that are overweight. At this point I showed how to make Mexican Wedding cookies, with the help of two people in the audience who came up to roll them. Then we ATE the cookies that I brought. Paleo Desserts are for Everybody. They taste delicious, just like your favorite sweets. And they’re healthier for everyone. When you have a gathering, and you want to bring something that everyone can eat no matter what their diet? Bring Paleo Desserts – and most people won’t even notice the difference. Paleo Desserts are for people who eat gluten-free, dairy-free, diabetic, low-carb, non-allergenic, vegan, non-inflammatory, and even tree-nut free – there’s a chart in the back of the book by diet. But more importantly it’s for everyone who loves delicious sweets. It’s easy to prepare these desserts. They leave you feeling light, not heavy, with no sugar rush or insulin response. These recipes are delicious to the taste buds, and healthy for the body. So now you have an alternative. You can enjoy your sweets knowing they’re nutritious and good for you, without a tinge of guilt. That’s why I wrote Paleo Desserts! Sunday after the talk was a beautiful day. I took an architectural tour down the Chicago River.